You know, I like my retired neighbor. He's friendly, he likes to laugh and he's generous. But he's a little too addicted to his lawn and the toys he uses to work on it. When I took this picture this morning he had been blowing leaves for almost an hour. It's frustrating when you go sit on the porch on a 70 degree day and before you get far into your reading he's out there either mowing his lawn, pressure cleaning his sidewalk or blowing leaves. Give a brother a break. You do gotta dig his uniform, though. He's not screwing around out there. In response to what Walt said I will say this in my neighbor's defense, he does use an electric blower. This may have turned into a BB gun sniping incident long ago if he used a gas blower. 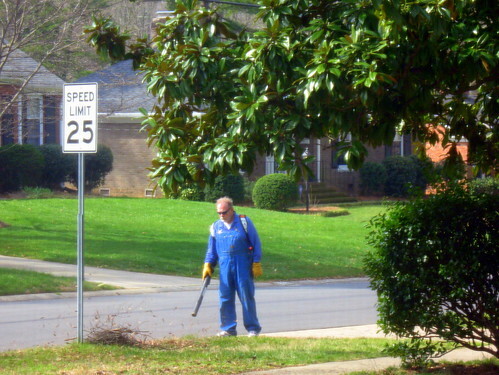 Gas powered leaf blowers are the worst form of noise pollution there is. When I worked third shift, my neighbor's kid had a minibike that sounded like an uzi being fired at a gong. I feel your pain.